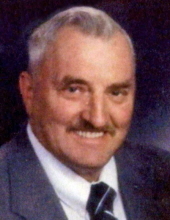 Martin Louis Arndt, 84, of Random Lake, passed away on November 13, 2016 at Sharon S. Richardson Community Hospice. He was born on November 22, 1931 to the late Marvin and Eleanore (Knuth) Arndt in Fredonia, WI. Martin married Kathleen L. Coldewe on August 6, 1955 at Zion United Methodist Church, in Batavia, WI. Martin graduated from Random Lake High School in 1950. He enlisted into the US Army in 1953. Martin and Kathy lived on the homestead in Fredonia while raising six children. He worked as a maintenance technician for over 20 years at Bolens in Port Washington, WI. Martin and Kathy retired to their Crooked Lake home and enjoyed owning and running a small bait shop and camp store for a nearby campground. He enjoyed driving around and visiting local establishments to see his fellows and the outdoors which included hunting, fishing and playing dartball. He was quite creative in setting up and helping with Crooked Trails Snowmobile Club activities at the annual corn roasts. Martin is survived by his wife of 61 years, Kathy; six children, Cindy Hansen, Lisa (Ken) LaMotte, Dawn (Jim) Fahney, Patty (Reino) Harju, Marty A. (Bernie) Arndt and Julia (Larry) Wright; 14 grandchildren, Paula (Tom) Gonzalez, Vicky Elliott, Tanya (James) Reilly, Brian Harvey, Jennifer Harvey, Tina (Dave) Krebsbach, Dan (Rachel) Mayer, Gene Wright, Valerie Wright, Andy Wright, Lisa (Jason) Medinger, Sam (Josh Marx) Arndt, Larry Wright and Tracii Faith; 7 step-grandchildren, Nate (Kathy) LaMotte, Jay (Mary) LaMotte, Melissa (Marty) Neis, Melinda (Pat) Sampson, Joe (Jackie) Fahney, Theresa (Josh) Wood and Sarah (John) Feider; and 39 great-grandchildren. He is further survived by four siblings, Geraine Eisentraut, Howard (Susie) Arndt, Sylvia Yoho and Daniel (Judy) Arndt. Martin is preceded in death by his parents; one grandchild, Amy Wright; one great-grandchild, Miguel Delarosa; two brothers, Robert (Katie) and Armin (Janet); a sister, Letha (Robert) LeClaire, two brothers-in-law, Elwood “Joe” Eisentraut and Dean Yoho and one sister-in-law, Margaret “Boots” Arndt. Visitation: Family will receive relatives and friends on Saturday, November 19, 2016 from 10:00 AM to 12:45 PM at Zacherl Funeral Home, 875 E. Division Street, Fond du Lac, WI 54935. Service: A memorial service will be held at the funeral home at 1:00 PM following the visitation. Cremation has taken place. "Email Address" would like to share the life celebration of Martin Louis Arndt. Click on the "link" to go to share a favorite memory or leave a condolence message for the family.